It seems Hurricane Irene isn't done tormenting us. The storm destroyed hundreds of pumpkin patches in the Northeast and this fall the region is expected to experience a shortage that will drive up the price of pumpkins. 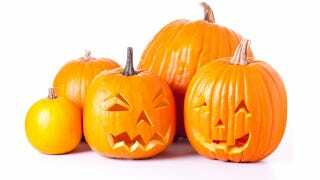 So far states haven't announced plans for jack-o'-lantern rationing, but you should prepare for the worst. Specifically, being forced to carve a pumpkin with a neighbor dressed as zombie Amy Winehouse.